Not all fans are able to make their pilgrimage to major geek events such as #NYCC this weekend. But thanks to today’s technology, global fans are able to enjoy and share their fandom in real time. We begin today’s blog post by first thanking Comixology for making comic books accessible to all mobile devices to readers across the globe, without the infuriating geo-blocking or zoning issues found in Amazon Kindle and Perfect Square Viz Media (through which we wanted to download digital copies of Voltron Force comic books, to no avail). #Voltron fangirls have been fangirling hard with the Robotech / Voltron crossover comics since the first issue launched on Christmas Eve 2013. When the series concluded with its fifth issue on Voltron’s 30th Anniversary on September 10, 2014, fangirls from Canada, Philippines and Australia had come together: we literally were counting down the days, hours and minutes til release day; we simultaneously downloadeded our copies on September 10, 10:00 A.M. New York Time (midnight in Melbourne and evening in Manila); and we shared real time reactions (and all the fangirl squealing) over Twitter. Today’s technology has made fangirling really fun on a global scale. We featured the Robotech / Voltron crossover comic series on this blog earlier this year and it is fitting that we conclude with a review from fangirls from three different countries outside the USA. Q1 – What attracted you to the crossover comics? The preview artwork promoted on Facebook and Twitter was amazing. We were all drawn to the comics right away. CAN : I grew up with Voltron and Robotech, so I felt as though I was getting a real treat. I also loved that it was set in the same 80’s Voltron type of setting. I was immediately hooked and couldn’t wait for the comic issue be released. 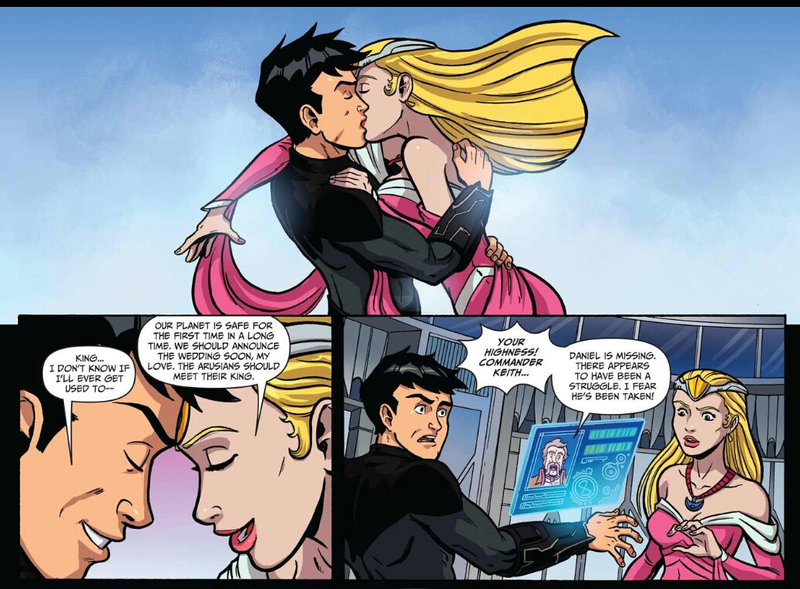 PHL : The preview page teased the fans about Keith making his move on Allura. AUS : Listening to Let’s Voltron’s podcast #2 helped a lot, letting the fans know the aim of the series in advance. Q2 – What did you like about the crossover comics series? CAN : I love so many things about this crossover story. Aside from the amazing artwork, I really enjoyed the overall story line and how it combined the different elements from both the Voltron and Robotech sides, as well as how it used the Omega Comet as the catalyst and how the events unfold in the alternate universes / dimensions. I also love how the ending tied back with the beginning, where the princess reminded Keith can he can call her Allura. PHL : I am not a fan of comics in general, but I adored the character interpretation (drawing) and overall look, including the color, of the comic. I was also intrigued by the story. AUS : The writers and artists kept within the already established / known universes both in story and art. In previous Voltron comics, there was a backlash from BOFQs and BOFKs against the DDP & Dynamite versions: that they ventured too far from the 80s Voltron story, that the art didn’t look anything like the Voltron members. Surely this crossover comics series should appease the old fans? Q3 – Any favourite issue / part among the five comics? CAN : I truly love all five issues and not sure I could pick just one, let alone one favorite part. PHL : I liked all issues. But if I have to choose favorites, I like the ones with chibi Keith in them. Q4 – How was your experience buying the comics? Did you buy the digital / printed or both? Why? CAN : I bought all my crossover comic issues online from Comixology. I thought the experience was great overall. You can’t beat the high-definition images! Since I can access them on my iPad, I can easily zoom in any elements. Lots of detail in some the background. Where I live, we only have one comic book store. It’s a small one and they cater to more popular and bigger selling issues. Unfortunately this crossover series (along with other Voltron comics) didn’t make the cut. So the ability to purchase printed issues locally was not possible. Therefore, I had to settle for digital version only. PHL : I have both digital and print editions. I bought the digital because it was easy to purchase online. I also bought the print because I find it easier to read and browse through. I still like the feel of paper. AUS : I bought both digital and print copies. I use Comixology’s Android app to access the digital edition comics. The Robotech / Voltron series is my very first complete comic book set. I’ve never been a comic book fan until I began fangirling Voltron in 2012. Q5 – Where there any areas on the comics they could’ve improved or changed? CAN : I really thought hard about this one, and really couldn’t think of any improvements. I am so in love with this series! The more read it over and over, the longer the love affair continues. PHL : I wanted to have the series stretched out a bit. As a fan, I felt a little short-changed. I think there was a lot more that could have been done with the story; with the characters. It feels a bit lacking especially if the creators intended this to be a special for the anniversaries of both franchises. AUS : Dynamite Comics‘ printed centrefold was a shocker (scantilly clad illustrations of Vampirella and Dejah Thoris? Seriously?) Voltron is a kid-friendly brand. I had to supervise my kid, making sure she didn’t see the adult-oriented centrefold and ads at the back of the comics. Q6 – What would you like to happen next in Voltron comics? CAN : I would like a #KeithandAllura centric story line or thread, (one where they actually kiss), done in the same 80’s Voltron DotU styling and also drawn by Elmer Damaso. 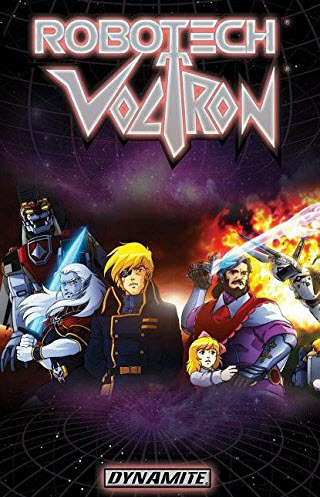 I’ve never read Voltron DDP series, but heard it was rather dark as well as a departure from DotU. I’ve read Voltron Dynamite comics, which are also a departure to the 80’s classic cartoon. 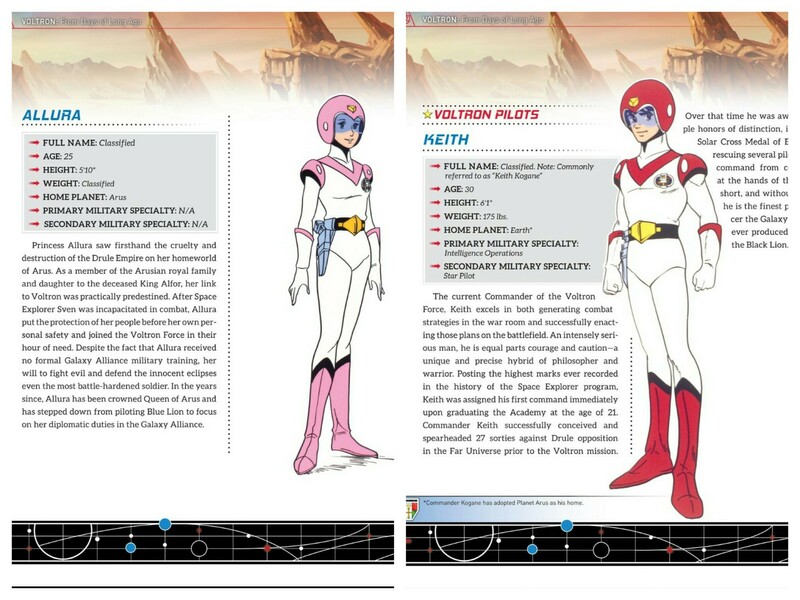 Which is why, IMHO this Robotech / Voltron crossover series is so special. PHL : As a #KeithAndAllura shipper, I would really want to see something a little more concrete between them; an actual story-line. Keith and Allura have been declared officially as canon, we need to see their relationship move on the next level on the comics series. 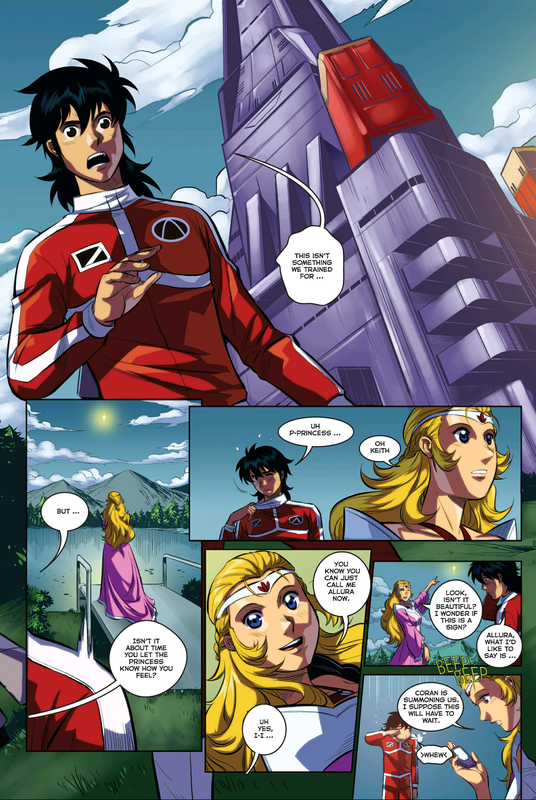 AUS :Please re-hire Elmer Damaso and the Digital Arts Chef to make 80s Voltron comics style again, to continue the adventures, focusing on #KeithandAllura. 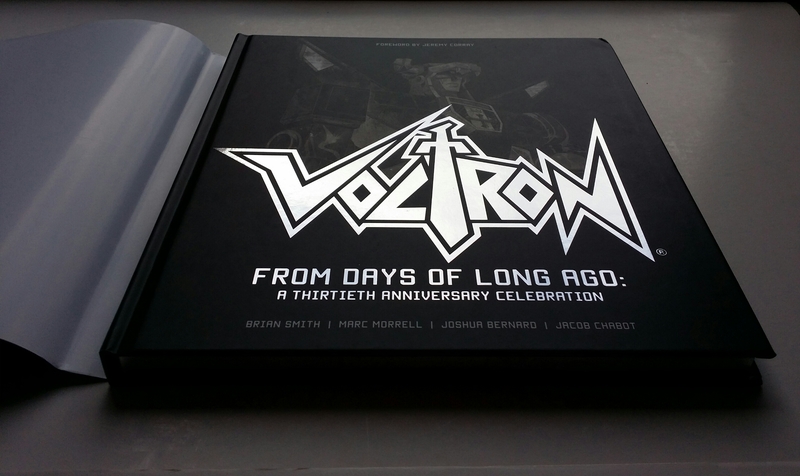 From days of not so long ago, earlier this year to be specific, fans from across the globe were finally able to purchase the Voltron Anniversary book “Voltron: From Days of Long Ago: A Thirtieth Anniversary Celebration” from their countries’ local bookstores. And like Voltron, fans from Italy, Canada, and Australia have come together and sent their reviews of this amazing coffee-table book. Q1: How did you find out about the Anniversary book? Flora (Italy) – I found out about the book on the web, through the Voltron fandom’s word of mouth. I’m a long time Voltron fan, I was a child when the show first aired in Italy, and I’ve been addicted to the show since then. When I heard a book was being issued to celebrate Voltron 30th anniversary, I couldn’t help but adding it to my collection. Fererik (Italy) – I found the news about Anniversary Book on KAEX Yahoogroup. I’m interested with the book because I’m a longtime Voltron fan. Josette (Canada) – I think a better question would be where did I not hear about this book. Before the book had been released, it had been frequently mentioned in the Let’s Voltron Podcasts, as well as on the Voltron Facebook and Twitter feeds. Also, the upcoming book was a popular topic of discussion between friends. Since I am truly a huge Voltron fan, this book being a commemoration of the big robot, it just seemed natural to buy a copy. Definitely considered as a must have for my collection. Cubbie (Australia) – Found about the book on social media. There was a whole flurry of tweets about preorders and where we could buy a copy especially for fans from overseas. 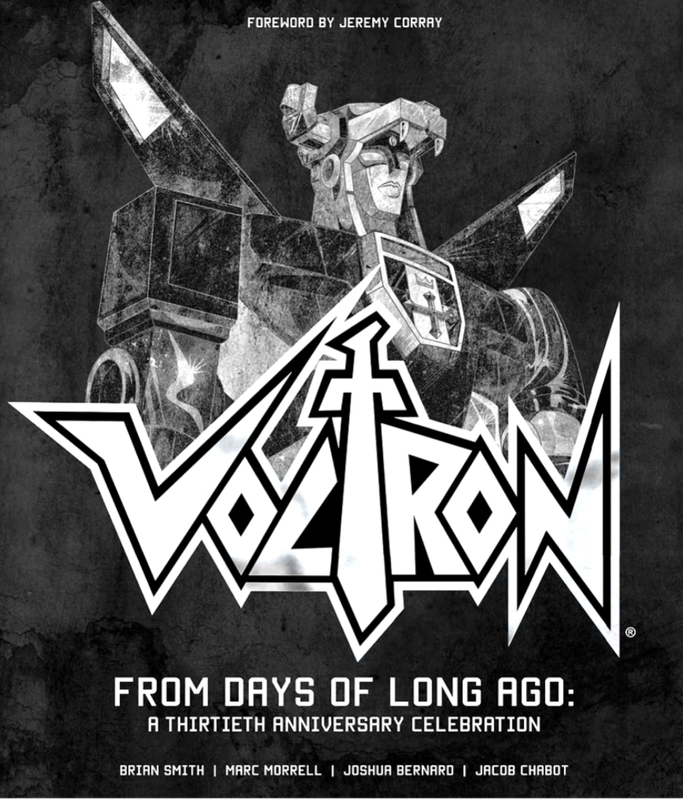 Promoted as a coffee-table book, it is a must-have for anyone who grew up with Voltron. Q2: How was your experience buying the book? Did you buy the digital / printed or both? Why? Flora (Italy) – I received the printed copy of the book through Book Depository, and everything went smooth and fine. The book arrived in a good packaging, and in perfect condition. When it comes to books, I usally prefer to have a printed-on-paper copy, as I like the feeling of the “real thing”. Fererik (Italy) – Usually I prefer printed book because I don’t have e-book reader or smartphone, I can read them only with computer. I prefer the printed version it’s more comfortable to read. Also the quality of this book is high, with the hardcover and silver printed details, so I thinks it’s a pleasure have the printed book. Josette (Canada) – Before the book was released, the Canadian Amazon website offered the option to pre-purchase a copy of the hardcover version of the book. So of course, with free-shipping, it was a no brainer. I received emails notifications when the book was shipped and it arrived directly at my door on time. Easy-peasy! By the time I heard that the digital version was available, I wasn’t sold on the idea of buying it. I was completely in love with my hardcover version. That poor book was totted with me almost everywhere I went so it could be shared with friends. It was proudly displayed on my desk at work and coworkers stopped by to have a look at it. A few actually obtained a copy for themselves as well. Robbie (Australia) – I only have the printed copy. Cubbie (Australia) – I have three different copies: a regular book, a special limited edition that was only available at New York Comic Con 2014, and an ebook / digital copy I purchased online from Amazon Kindle. The regular copy is for reference and is dog-eared from use; the special edition is a signed copy and a prized part of my collection (and not for everyday reading); while the digital ebook copy is very accessible via my mobile or tablet. Q3: What did you like about the book in general? Flora (Italy) – I love its length – which appeals to a fan’s appetite – the luxury edition binding, and the beautiful shiny cover. I also like the fact it’s well presented and neatly organised, with different sections for each aspect of the show. 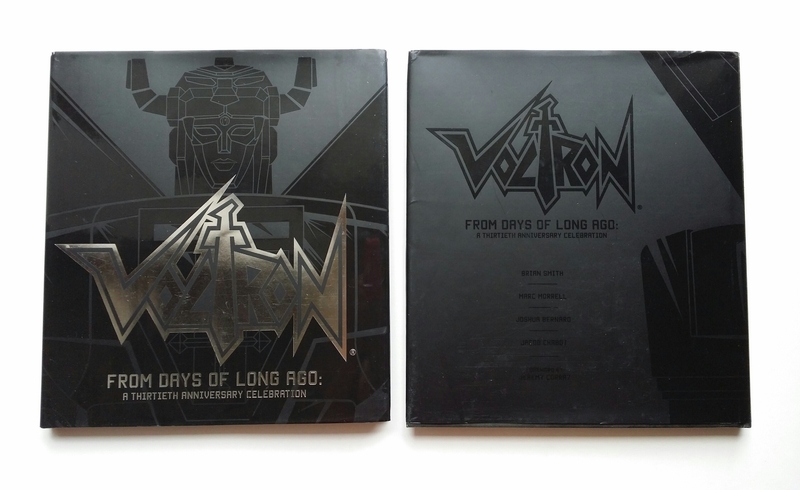 Fererik (Italy) – I like the book design, the hardcover and all the details that I can discover about Voltron and characters. It’s a wonderful book for all Voltron fans. Josette (Canada) – Overall, I really liked the book. I was happy to see the variety of topics that were covered, such as the toys and Robeast index. I was also interested to see mini-bios for Lion pilots and villains and supporting characters. Really felt that this book is not only for the avid fan, but for just about anyone that that would like to learn more about Voltron. Robbie (Australia) – I like the format and the different sections. My son loved the robeast cards and wondered where we could possibly buy these cards. Cubbie (Australia) – I love all the different sections, from the history of Voltron and the people who worked together on the cartoons to the section about the toys launched throughout the years was an absolute eye-opener. The book really lived up as a ‘coffee-table’ book, designed as a showcase piece for any book lover and child of the eighties. Q4: What was your favourite part of the anniv book? Any particular section / chapter of the book you liked most? Flora (Italy) – I really loved “Part1- The Story”, which recounts how Voltron came to be. It’s a very interesting insight on the people behind Voltron, and how they worked to give form to the show we know and love. This part really exudes the sheer passion the production crew involved in the project had for Voltron, and this really sparkled a flow of admiration and nostalgia from my part. The characters’ files were great too, as well as the chapter devoted to the Universe of Voltron, so full of interesting details about the settings and mythologies surrounding our favourite Giant Robot. The wonderfully drawn comic that ends the book, also gives closure to the saga of Voltron (but with some hints for future adventures) and – as a long-time fan of Keith and Allura – I particularly loved their long awaited kiss and the reference to a soon-to-be royal wedding! Fererik (Italy) – I’m a classic Voltron fan, so I love so much the chapter about old 80’s version. I like the information about characters and the sketch sheets. It was so interesting to read about technical info about Voltron, the robot lions, and robeasts. 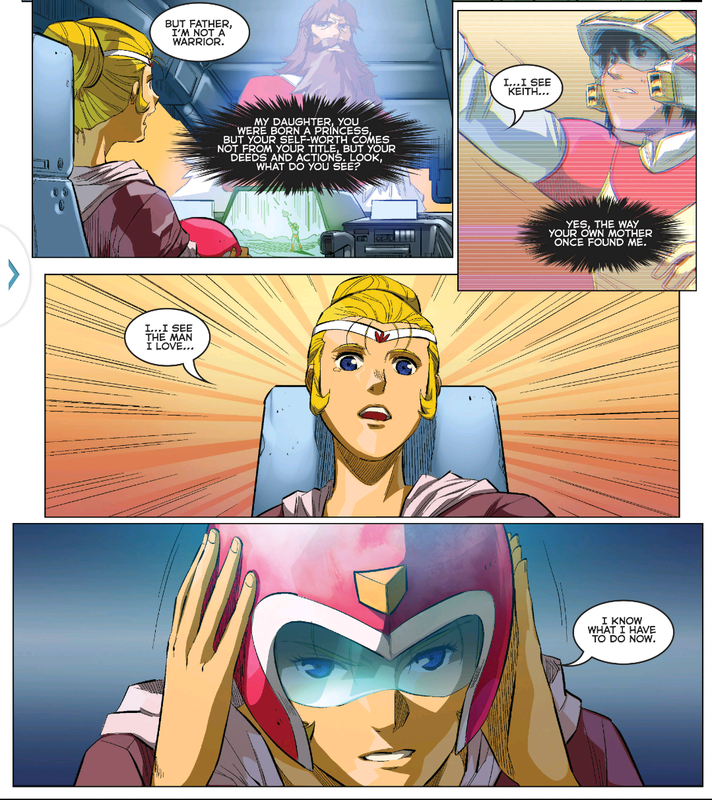 Josette (Canada) – My absolute favourite part of the book, was the Voltron Force comics section. The day the book was delivered, I immediately read that section first and read it over like a dozen times Since the Voltron Force animated series only had one season, and ended on a cliffhanger, it left me wondering what happened next. Most importantly, I was quite interested to see what happened between Keith and Allura. The comic also ended on a bit of a cliffhanger, which disappointed me at first, but I now feel that it leaves the door open for the series to be picked up again. Robbie (Australia) – I love the comics section: I love the way it was drawn with the vibrant colours and the drama. Cubbie (Australia) – As a fan of the Voltron Force series, the epilogue comics was my most-awaited/coveted section, brilliant storytelling by Brian Smith and artwork of Voltron Force Keith and Allura by Jacob Chabot. Q5: Was there anything you think the authors could’ve improved, changed, or added? Flora (Italy) – The book is wonderful the way it is, and I love it wholeheartedly. Maybe a few more pics taken from the original show could have been added to the chapter dedicated to the characters. A comparative gallery with all graphic incarnations of the characters would have been interesting, to showcase how they have changed through time. Fererik (Italy) – In my opinion the characters in the comics is so different from classic version (the only one see in the Italy television is the first season) so I don’t like it so much. Also Vehicle Voltron isn’t interesting for me, but only because I never see them in italian version. If possible I would like to see more about classic version, more sketch sheets preparatory and a comic in classic anime style. Josette (Canada) – The Lion descriptions were cool, but some were inaccurate. For instance, it mentions that “the deepest dive on record made by a Blue Lion pilot took place in the famed Greater Arusian Trench”. This is contrary to the remark in the episode Dark Blue where it was mentioned that the lions had never been tested in such depths before. I would have also preferred if they would have used the actual names of the weapons like they did in the episodes, such as“Electro Force Cross” and “Spinning Laser Blades” instead of “Atomic Emblem” and “Shooting Stars”. Even though I’m not a Vehicle Voltron fan, I was disappointed that they didn’t at least make mention of the Pilot’s names. The DVD box cover already features the related artwork and they could have easily reused that for that section of the book. It was as though they rushed through this section. Robbie (Australia) – Nothing. I love the book how it was divided into specific sections. Cubbie (Australia) – I can’t help it as I am a shipper at heart: I would have loved to see Keith and Allura finally tie the knot (Who said they didn’t before Keith left with the rest of the team?) Oh, and I would of course have loved a Happily-Ever-After ending. Then again, that’s why we’re here fangirling Voltron, writing fanfiction, and drawing fanart because they didn’t close the door on this specific Voltron universe / version. The Voltron Anniv book was once available in Kindle? Too bad, I missed that. Great post!